« Who Should I Collect? With every video box break (see below or click here), there is a review. This is that review. You know, the one I was just talking about. As far as base sets go, this is one of the smallest I’ve encountered in a while. I guess that’s why my major (and almost only) gripe about this product is so major. When the regular set is only 90 cards long, I don’t want to see multiple cards of the same player – no matter how good he may be. I understand that part of the mission statement of the set is to celebrate some of the game’s undying historical achievements and sometimes several of those belong to one person. But I also understand that there are more than 90 of these achievements and it wouldn’t be hard to substitute these out with a different player. That way we could avoid 3 Babe Ruth cards, 4 Cal Ripken Jr. cards, 2 Ken Griffey Jr. cards, etc. The other gripe (might as well just get them out of the way) is that some of the accomplishments aren’t really card-worthy. You start out with the called shot, Bobby Thompson, Kirk Gibson. Then you follow that with a card celebrating Ryan Howard winning NL Player of the Week. Seriously? I guess they’re just trying to save some good stuff for the next year’s set. And maybe I could add the Presidential and MJ cards, although there is a historical aspect (and exclusive licenses) related to those. Alright. What’s good about the main set? Just about everything else. The simple gold foil border, with just a hint of flair, frames and properly accentuates the paintings. The other foil on the card is minimal and doesn’t get in the way or detract from the picture. The canvas texture is a really nice touch and gives the cards a more high-end look to them, even though the price is lower-mid range. Shouldn't Biggio be drawn being hit by a pitch? Or holding the bat differently? 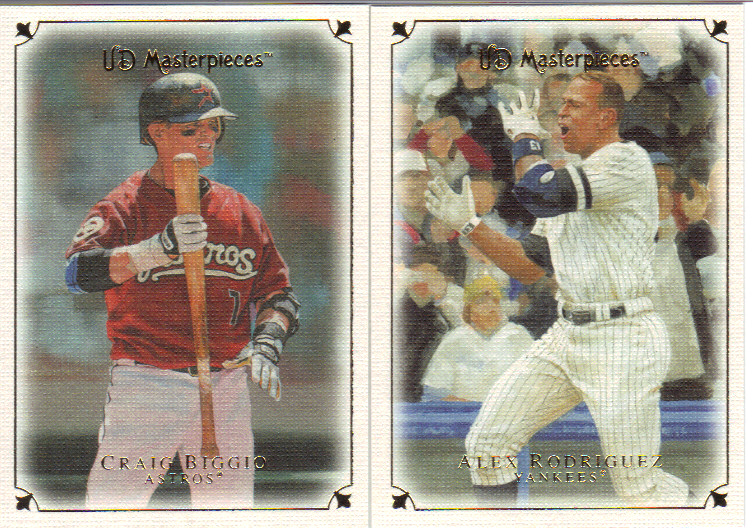 Shouldn't A-Rod not be eating a giant invisible sandwich? Or not leading mice out of the city? But most of them do well to capture the moments and players on canvas. Brilliant! One might even go so far as to say masterpiece. You have to appreciate and stare in awe at the amount of detail and the life-like representations the artists paint. You have to. You simply can’t find an artists rendering of a player that looks awkward or weird or nothing like the player. Several people spent a lot of time and effort working on this set and it shows. The sad part is that the artists aren’t credited anywhere on the individual cards. 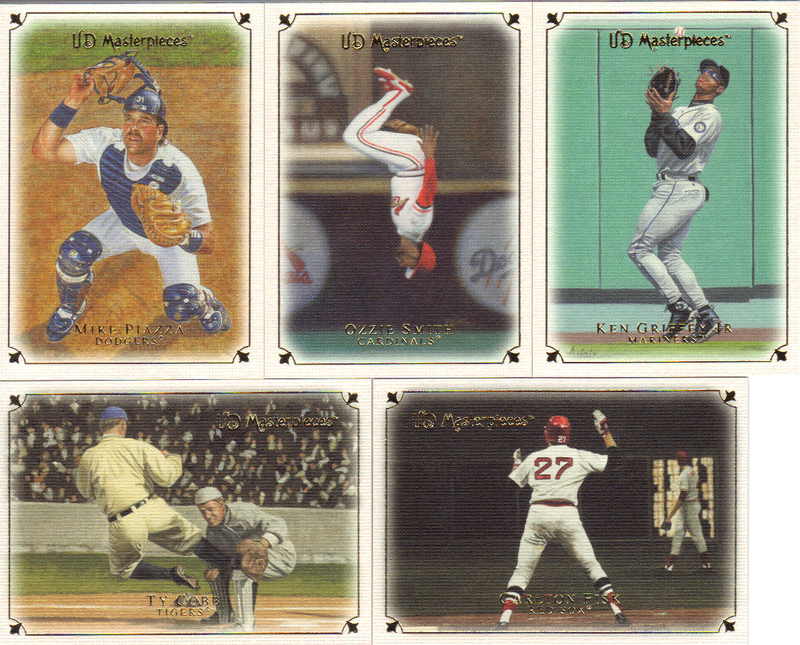 There aren’t really any “inserts” to speak of that aren’t parallels and/or “hits.” I would have liked to see maybe one or two different insert sets. Something where you depict players using different artistic movements would be good. Or maybe a straight-up portrait painting instead of game action. No, instead we get a confusing rainbow of framed parallels. If Upper Deck were smart, they would include a guide in every box to let you know what type you have, because just looking at the color isn’t enough. And of course, there’s nothing on the card itself that will tell you what you have. Cual es eso? Azul o Otro Azul? Muy dificil! We got five green bordered cards. It turns out that upon closer inspection two of them are “Green Linen” and the other three are “Windsor Green.” Are they different colored greens? No. The linen’s have the canvas texture on the border as well, something you can only distinguish under a bright light at the right angle. We thought we had a Blue Steel Griffey, you know since it’s numbered to 50. Nope. It’s called “Hades,” which is also numbered to 50. So, why is Hades also blue? And why are there also Celestial Blue and Blue Linen and Persian Blue Linen? Waaaaay too many parallels with waaaaay too little distinction. I count 15 color border variations. 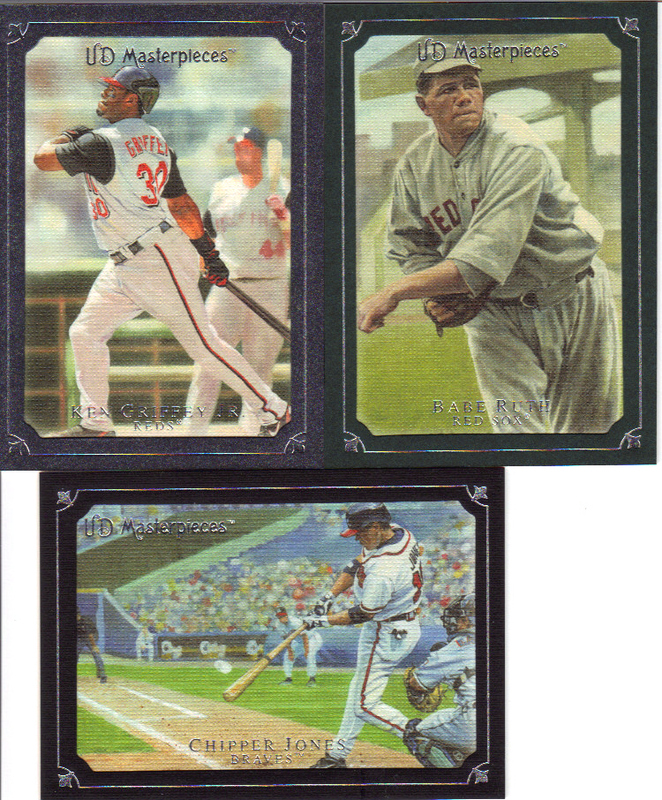 Then I believe there are a couple others besides printing plates. No markings on the packs. No list on the box. No guide in the boxes or anywhere really. This kind of thing makes me really mad. Player collectors beware. I guess it’s a good thing there are only 60 or so different players in the set after all. That’ll lower your chances of collecting someone in the set. The hits have variations too, but let’s not get into that again. No, I want to instead focus on another crazy little thing I noticed. Take a look at our Sowers autograph. You may have to zoom in. In the bottom left hand corner, do you see anything odd? Yes, that’s right, they misspelled their own set on the autographs. It’s that way on the back of these cards, too. Stroke of Genius, indeed. Beside the auto, which was less than stellar but is on card (! ), you get three relics in a box. Four hits in 18 packs is a pretty damn nice ratio. The relics are designed well for the most part, but I wish they could have utilized the empty space in the lower-third a bit better. It’s also disappointing that neither the autos, nor the relics have paintings. You’d think that they could at least use the paintings that exist for players in the set. 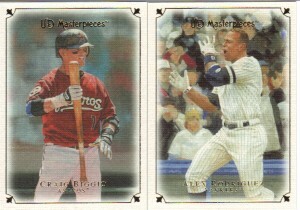 Also, maybe they shouldn’t have included people as hits if they aren’t appearing in the base set? Hmm? This would get much higher marks if it weren’t for the completely unnecessary amount of confusing parallels. I’m very glad I don’t collect a specific player on this checklist, because there’s no way I’m bringing a microscope to the card show to make sure I’m buying the correct variation. As it stands, I would suggest collecting just the regular set. The box will get you just about there in one go (we got 64 of 90, no dupes in our box) and you could try selling the parallels off to random bidders to pay for what’s left to build. So, if you’re willing and/or able to look past the BS and the mistakes and the small amount of different players on the checklist, then this is a fun set. The art looks really nice and is presented well. The hits are plentiful, although not always so great. The fun is still abundant. Nice catch on the Sowers auto…too funny. I never noticed the misspelling on the autos!!! In that kind of set, which obviously involved a great deal of care in production, that’s a killer. Jon, your captions get funnier with every post. I really hope people are reading them. People, read them! There are three resources that come to mind most immediately. One is a fellow blog you can find on our blogroll – I Am Joe Collector. He is a masterpieces supercollector of the highest order and he is how we learned the difference between the black and green borders. You may have found the same. If those don’t work, I would suggest looking them up on Check out My Cards or Zistle.com. Both of those sites have great functionality and a deep picture database to draw from. The information comes from reliable card experts, so you can usually be secure that you’re getting proper guidance in your searches. I hope that helps. Good luck in your Lincecum quest!